There’s a food festival on right now. Coming off the back of three (Actually four! Festival City, food tour of Block 338, Winter Wonderland, and Streat Food Festival) food-related festivals. There are definitely moments where I’ve thought to myself, do people not do anything else but go to the mall and eat, in this country? In all fairness, these outdoor festivals are a good excuse to be outside. Especially when we can actually go outside. Summer’s coming and I’m trying to nothing think about that fact too much. And I do love heading out into the crowds with my camera, just snapping away at everything around me. Juggling my camera, a handful of food, and my bag. It’s an art I’m getting better at. I took this shot after wandering in-and-around the many food stalls, trucks, and trailers to find something to eat. 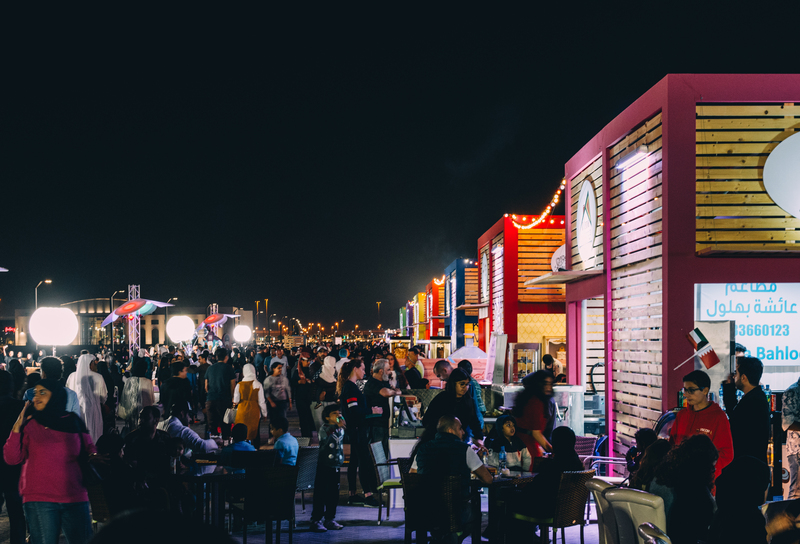 Burgers still reign supreme in Bahrain. Though I think the grilled cheese sandwich is soon to take its crown. Sadly, the last thing I ever want to eat at these things is a burger. And the lack of vegetarian food is always surprising. Though, the dessert selection is always good. Note for when the next inevitable food festival rolls around—eat first, but get dessert out.